We have improved Kalix's navigation, making it easier to move around Kalix. Use Sections to move quickly between related pages. 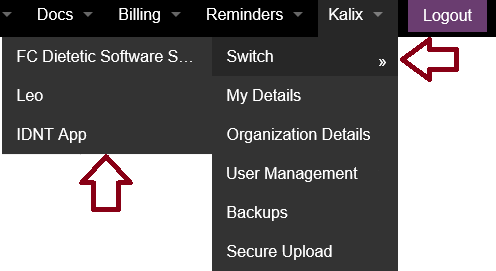 Kalix now allows you to access multiple accounts (called Organizations) with one login. You can choose to create a new organization for each of your practice locations or places of work. Move between organizations using the Switch tab. Place of service can now be saved against billing items.